Official Hatsune Miku illustrations by KEI (left) and iXima (center & right). Hatsune Miku is a popular character in a growing line of singing synthesizers based on the software engine called VOCALOID, developed by YAMAHA Corporation. Under license of this technology, the company Crypton Future Media created “Hatsune Miku”. 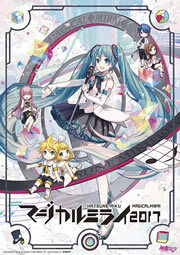 Envisioned as a voice for composing songs, Miku’s voice bank software was developed for the VOCALOID 2 engine, and was released on August 31st, 2007 in Japan. Hatsune Miku’s software box art featured an anime-style character design with teal colored pigtails, along with a brief description of her character. It was a unique departure from how many companies advertised their VOCALOID products in the past. The first creations with Hatsune Miku’s software and character image sparked an interest in the VOCALOID software that had previously been unforeseen, and she quickly spread across the internet via social media and video sites like Nico Nico Douga and YouTube. To date, an estimated over 500,000 songs have been produced using Hatsune Miku’s software, and over a million fan illustrations have been created. Today, Hatsune Miku has many fans around the world, and has dedicated exhibition and concert events in various countries. She’s had official collaborations with companies like Coca Cola, Toyota, Google, Domino’s and more. She has performed opening acts for Lady Gaga’s Artpop Ball tour across the U.S. and Canada, and also made an appearance on the David Letterman show. She’s one of Japan’s biggest pop idols, despite being an artist created by thousands and thousands of people. Hatsune Miku has grown beyond being a mere software, and is now an icon for a vast collaborative community for professionals and amateurs alike. She continues to grow in unpredictable ways, but we’ll do our best to keep up with her. MikuFan is the premiere English website to keep fans around the world informed on what’s new with their favorite twintailed diva. This site is running on WordPress. The header illustration was drawn by Asahi Kuroi (Twitter and Pixiv). Any questions, comments or suggestions can be sent to the email(s) below. News Suggestions: Please visit our News Suggestions page.